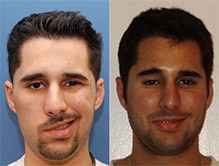 Facial paralysis treatments are available to help improve the effects of partial facial weakness or permanent paralysis. In addition, there are many types of lower facial reanimation that can help a facial paralysis patient restore his or her smile. What Is Lower Facial Reanimation? Furthermore, facial paralysis commonly results in aesthetic, functional and psychosocial disease, along with facial asymmetry while an individual is at rest and/or moving. In most cases, facial paralysis patients deal with oral incompetence, facial asymmetry and the inability to make a smile. However, lower facial reanimation has been shown to help facial paralysis patients improve facial symmetry and reduce functional deficits. Surgical Intervention: Consists of static and dynamic reanimation. Static reanimation focuses on improving an individual’s facial symmetry at rest and does not spontaneously reanimate the face. Comparatively, dynamic reanimation is divided into volitional (patient is aware of facial movements) and spontaneous (patient is unaware of facial movements) procedures. Static Slings: Improves facial symmetry and reduces drooling, biting of the inner gum and other facial paralysis side effects. Static slings do not address the smile mechanism directly but may help enhance a patient’s perception of the smile and face. Temporalis Transfer: Involves attaching a portion of the temporalis muscle to the oral commissure. 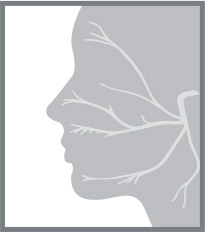 During a temporalis transfer, the motor branches of the trigeminal nerve are activated to recreate the smile mechanism. Non-Surgical Intervention: Includes the use of neuromodulators, injectable fillers and neuromuscular rehabilitation. Usually, the best candidates for non-surgical intervention are individuals with synkinesis, partial long-term paralysis and congenital unilateral lower lip palsy (CULLP). Lower facial reanimation may help a facial paralysis patient restore the smile, but it is important to note that a facial paralysis patient must be evaluated before treatment. 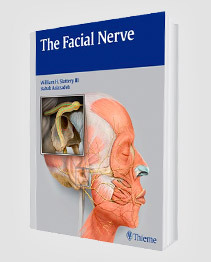 A facial paralysis patient should meet with a facial nerve expert like Dr. Babak Azizzadeh to receive a physical examination to determine the etiology of his or her facial paralysis. Dr. Azizzadeh completed a sub-specialized fellowship in facial plastic and reconstructive surgery at Harvard Medical School with special emphasis on the facial nerve and facial reanimation. 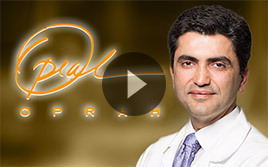 He is a world-leader in facial nerve surgery, and is the only facial nerve expert to be featured on The Oprah Winfrey show for his expertise. As part of a physical examination, he will study an individual’s eyes for narrowing and assess a person’s facial movements in relation to each of the facial nerve branches. Dr. Azizzadeh also will ask an individual to raise the eyebrows, wrinkle the nose, smile and perform other facial movements. Severity of Facial Paralysis and Synkinesis: Individuals with partial facial paralysis who have synkinesis often will require a different treatment protocol than those who suffer complete facial paralysis. Presence of Bell’s Palsy: If a patient is experiencing Bell’s palsy, it is important to wait at least a year before making any treatment decisions, as in 85% of cases Bell’s palsy will go away completely on its own. Duration of Facial Palsy: The duration of facial palsy may dictate treatment, as the majority of surgical interventions are performed after the regenerative functions of the nerve have been established (about one year). A physical examination provides Dr. Azizzadeh with the necessary information to understand the history behind a person’s facial paralysis. After the examination, he will be able to offer facial reanimation recommendations.